WHITE LIGHTNING: die comma i or die comma why? die comma i or die comma why? 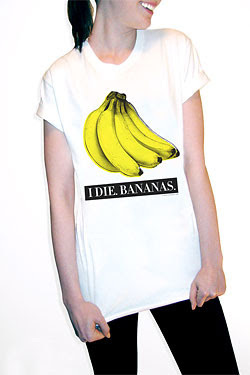 so, i am assuming we all saw on these here internets that there are zoe / i die / bananas tees coming out? it's fine. it's GOOD, but it's not...how do you say...making me die? it's not...what i am FEELING. it isn't getting the POINT ACROSS in the way that i want. so brendan..can you make me a present or what? yes, i went to art school. yes, i am gainfully employed in the graphic design realm..jealous?? I vote for the whiskey stained sweatshirt! It hits a little to close to Warhol for me, which is never good in this day and age. There are a lot of fruits out there in the world. Why not grapes or watermelon? Lady Lightning, I'd buy one of yours! Mmm, I'm not really feeling it either. You should make the second one and I'll make YSL tees and then we'll open up a shop and sell them together! Am I old or do I totally not get the "i die. bananas" shirt? i would buy one of those creations in a heartbeat. 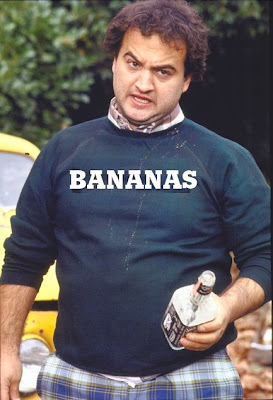 belushi and the jack win every time.